We’re happy to announce a new integration! DaCast and Cleeng have come together to make it easier than ever for DaCast users to integrate Cleeng’s powerful pay per view streaming and subscription solution for video monetization. Cleeng’s paywall solution and its advanced features can now be added easily to DaCast user accounts! Monetization is one of the most important features for DaCast users. Cleeng allows users to take payments in currencies other than USD or EUR, and in other languages too. We think you’ll love it. This blog will provide more detail on this service. At the end of this piece, we’ll break down exactly how to get started with Cleeng and DaCast instantly. 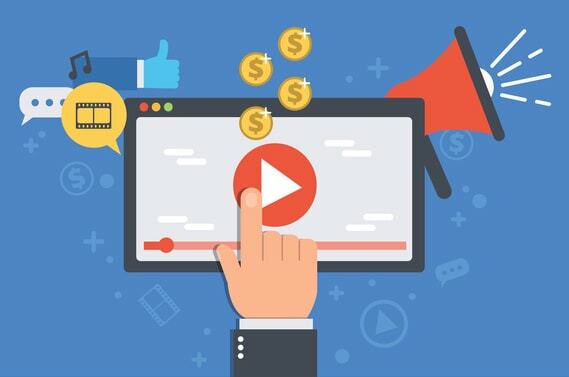 It’s a great time to be involved in live streaming and online video monetization. Watching subscription-based OTT video services is a daily habit for 60 percent of adults in the US. Worldwide OTT revenue was roughly $46.5 billion in 2017. That number is expected to rise to $83.4 billion by 2022. DaCast has its own built-in solution for pay per view streaming and video monetization. This paywall includes support for pay-per-view streaming and subscriptions in USD and EUR currencies. It’s a great tool for our customers. However, we wanted to offer features for multi-currencies and multi-languages for people that need them. With Cleeng these advanced monetization features are now available. 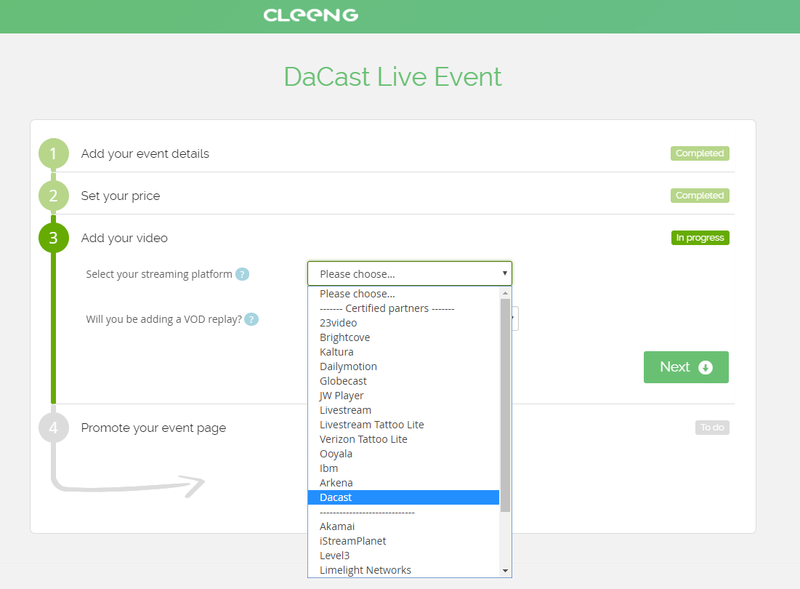 The direct DaCast integration into the Cleeng paywall facilitates setting up paid live and VOD events for all DaCast and Cleeng users. This mutually beneficial partnership benefits Cleeng by providing them with a new and bigger user base, and allows us to offer Cleeng’s exceptional paywall service to DaCast customers! It’s a win-win. Cleeng was originally founded in 2011. Since then, they have worked with major brands such as Foxtel, Sky, Sinclair Broadcaster Group and Golden Boy Promotions. From offices in New York, Amsterdam, and Poland, they provide their service as well as rapid customer support to users in need of help. Cleeng’s paywall services include a wide range of powerful features that expand on the basics. Let’s take a look at the key features of their platform. It’s a long list, so hold onto your hat! Cleeng allows you to authenticate users across multiple devices. This means that viewers can start watching on one device, then begin using another seamlessly. 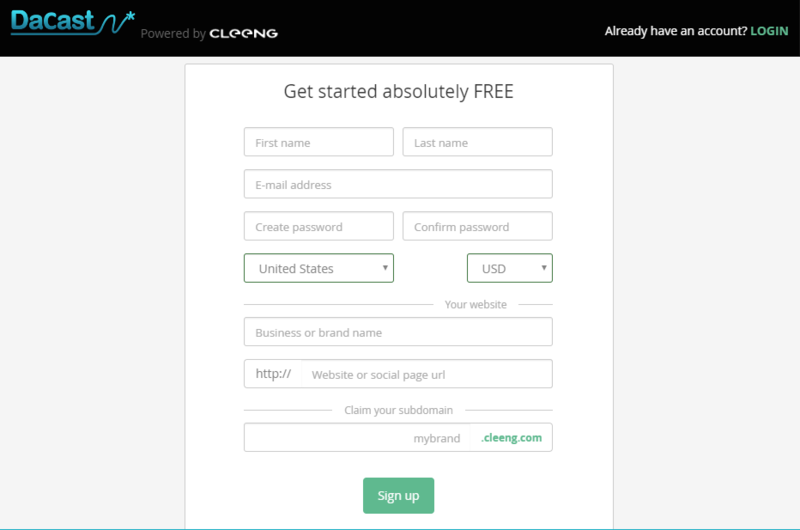 Cleeng supports a wide range of monetization methods. These include support for live streaming PPV (Pay-Per-View), subscriptions, and lead capture. This allows businesses to diversify their funding streams, or choose the method that works best for them. Cleeng integrates a number of tools for protecting video content from unauthorized access. This includes a tool for advanced forensic watermarking. Browser fingerprinting and IP/device controls add more functionality in this area. Cleeng provides advanced analytics around key monetization performance indicators. These include churn, retention, and subscriber demographics. This data is presented in an easy-to-use dashboard format. Let’s move on now and take a look at a number of case studies from Cleeng. The first comes from Supercross Live. This highly popular off-road motorcycle organization recently launched an online portal for live and on-demand video. Cleeng provides their backbone payment solution offering their season video pass, as well as access to individual races and a library of past content. Another great case study comes from the NBL, or National Basketball League, is the professional basketball league of Australia and New Zealand. A highly successful league, several former NBL players are thriving in the NBA. In the past few years, The NBL has moved towards broadcasting all games online via both live streaming and later viewing. Cleeng allows NBL to monetize via subscriptions (season pass) and pay per view streaming for single games. Additionally, Cleeng allows them to provide free access to customers of certain TV channels, and authenticate users on different devices. Now that we’ve looked at some case studies, you’re probably about ready to start using Cleeng yourself. Luckily, it’s a pretty easy process. To get started, you need two things. First, you’ll need a DaCast account. Second, you’ll need a Cleeng account created via their dedicated signup page for DaCast users. We’re really excited for more DaCast users to begin using Cleeng. As you can see from the extensive feature lists, their paywall is packed with functionality. And as the case studies show, it’s been tested in high-volume environments and found to be highly effective. Are you using Cleeng, or planning to? Let us know what you think when you get started! We’d love to hear from you about how it works for your streaming monetization needs. If you’re not already signed up for DaCast, we recommend taking advantage of our free trial to test out the platform for yourself. You can start today with DaCast’s 30-day free trial (no credit card required). Do you have any questions, comments, or concerns about live streaming monetization, Cleeng, or our partnership? Let us know in the comments section, below! For exclusive offers and regular tips on live streaming, feel free to join our LinkedIn group.